Blog | Darrell Griffin | Author of "God Think – Creative Thinking for Believers"
Author of "God Think – Creative Thinking for Believers"
I saw this picture on CNN.com today and it reminded me what a great country we life in. Let’s not let the crazy left wing and crazy right wing nut jobs take away our AMERICA. I am going to go put my flag out in front of my house for no other reason than American pride! All of us church goers can remember little things we can do in church, things we shouldn’t do in church, and things We wish we didn’t do in church. Please submit your examples of these things. Once I get a thousand items I will publish my next book, “Little Things I can’t do in church, things I shouldn’t do in church and things I wish I didn’t do in church. Here are a few items that have already been submitted to me. I can either ad you items attributing the item to you or make them anonymous. The guy that normally sits next to me, a few seats down, will often talk out his hanky, blow his nose and put his hanky back in his pocket. It is tradition in our church to sing a few songs then standup and great everyone around you. I will move down the row of seats just to see if he has any boogers or snot in his mustache. He never does. I cannot blow my nose in public for fear of having left over boogers or snot in my mustache or as they say, bats in the cave. Or church always puts the words to the songs on two large screens in the front of the church. When we start singing I have to “mouth” a lot of the word to look like I am singing because I can’t keep up. The other day one of my friends, Pastor Rick, and I were talking at lunch. He is responsible for counting the offerings from church on Monday mornings. He said one of his irritants is when people will put empty tithing envelops in the offering basket. I didn’t tell him that I was one of those people. I always pay tithes, but I pay every two weeks. In the off weeks I put an empty envelop so people don’t think I am not tithing. We have a large church that accommodates 1,500 people in the sanctuary. We have 5 services each weekend. I like to sit in the third row just to the left of preachers podium. My wife and I get to church early just so I can get my usual seat. On occasion some one gets there before me and take “my” seat. I find myself secretly wishing that someone will come and tell them that they left their lights on, or their kids starts crying so they have to get up and leave “my” seat. I find myself asking for forgiveness for these kinds of thoughts during open prayer. We have great speakers at our church. The average preacher’s message is about 45 minutes long. I tend to have an “accountant’s” personality so after about 43 minutes I fold my Bible closed and start zipping it’s cover closed. The last few minutes of the sermons can sometimes be the most important but a few of the unfortunate people that sit around me can only hear the teeth in my Bible zipper closing together. Our church takes holy communion every service. Often I will chew gum. I have learned to push the gum to one cheek and chew the communion wafer and drink the grape juice with the other check. One time on the way to church I bought grape bubble gum so it would blend with the grape juice and communion wafer I took during Holy communion. I was seated listening to the sermon when an attractive young lady had to slip past me to leave the sanctuary. As she approached me, I set back to let her pass. As she got right in from of me she passed gas. I was a little embarrassed as it stunk, and she was so pretty and well groomed I know everyone thought it was me. I was walking in to the sanctuary when I had the need to spit. I like to think I am a respectful person so I spit on the grass. After I wiped the remaining spit from my lips I looked and there was a statue of Mary holding baby Jesus. If I could have sucked the spit off the lawn back into my mouth I would have done it. I had not worn my Hushpuppies for over a year so I thought I would slip them on and go for a stroll. I pulled them out of the box slipped my feet into them. For some reason when I tied them up they seemed a little more loose than normal. I took a few steps and the outer soles both stayed where I stood before taking my first step. After a couple of more steps the inner soles decided they didn’t want to walk any more so after a few steps the only part of the shoe that stayed on my feet were the upper part of the shoes. Do you think Hushpuppies should give me a full refund or a new pair of shows that stay in one piece? I went to Las Vegas with my lovely wife Kim, my daughter Alexis, son Jordan and Alexis boyfriend, Jeff. It has been about 10 years since I was in LV and wow has it changed. I remember when you could go to the casinos downtown and get a huge shrimp bowl for two dollars and snag a buffet breakfast, lunch or dinner for $5 bucks. Not any more. We stayed at Treasurer Island and had their buffet for one night. It cost $29 each. Now every hotel charges a resort fee of about $25 a night. It is for internet, use of the gym and discounts for their buffets. The internet never worked the the $25 resort fee was a waste of money. We ventured out to the Venetian for their $60 buffet. It was better but it didn’t measure up to the old $5 buffets 10 years ago. I am a big time gambler. After dinner one night I went down stairs to the casino and was delighted when I noticed my favorite gambling device – the penny slots. I thought wow! Some things don’t change. I planted myself in front of a machine that I just knew was going to make me penny rich. I couldn’t find the handle to pull. Now they are electronic. I also noticed there was no tray at the bottom of the machine to catch my winnings. Again, the are now all electronic. Okay, I felt I could live with that although I used to love the sound of all those coins falling in the tray when you got all “7’s”. I slid my $20 dollar bill into the electronic slot and a few electronic bells and whistles went off to make me feel good. I started to play a penny but found the least I could bet was 40 cents. Although there are still penny slots in LV their minimum bets are 40 cents. Well it took the machine about ten minutes to take my entire gambling stake of $20. We did see a really cool trained animal show “Popovich’s Animal Comedy Show.” Just like my high stakes gambling we reached for the top shelf when we picked the show we wanted to see. We did see one of the coolest buildings I have ever seen when we drove downtown. It was called the Cleveland Brain Center. After spending three days in LV we took the 5 hour drive home. First thing I did was take a shower to wash the LV coating off my body. Although I did not particularly enjoy LV, I totally enjoyed the time spent with my family. This is another segment of “Last Journey.” This is a book that is written by me with the help of my son SSG Darrell Griffin, Jr. He was killed by a sniper just outside of Baghdad. At the time he and I were working on a book that we planned to call “The Great Conversation.” He was conflicted about having to kill men or be killed. He was a philosopher and he had difficulty reconciling his mission as a combat soldier with the teachings of the great philosophers. This is except 5. We will be putting excerpts on this blog for the entire book so we estimate there will be about 100 excerpts. In the prior excerpt Linda and I found a place to live. It was tough since we were both only 16. I have just gotten home from a full day at school and a full day at work. I grabbed a soda and some chips and turned on the television. There was Nixon with his five o’clock shadow, looking nervous: Good evening my fellow Americans. Ten days ago, in my report to the Nation on Vietnam, I announced a decision to withdraw an additional 150,000 Americans from Vietnam over the next year. I said then that I was making that decision despite our concern over increased enemy activity in Laos, Cambodia, and in South Vietnam. After full consultation with the National with the National Security council, Ambassador Bunker, General Abrams, and my other advisors, I have concluded that the actions of the enemy in the last ten days clearly endanger the lives of Americans who are in Vietnam now and would constitute an unacceptable risk to those who will be there after withdrawal of another 150,000. To protect our men who are in Vietnam, and to guarantee the continued success of our withdrawal and Vietnamization program, I have concluded that the time has come for action. Tonight, American and South Vietnamese units will attack the headquarters for the entire Communist military operation in South Vietnam. My first thought was: How cold does it get in Canada? I changed the channel and adjusted the rabbit ears on our hand-me-down TV. The scene was a bunch of unshaven, tired-looking young men walking a trail through a Viet Nam jungle. There was napalm burning in the background. The only sound coming from the TV was the deadly noise of machine guns and helicopters swooshing by overhead. The words over the scene were “and today’s body count is….” I switched the channel again. I mouthed Walter Cronkite’s “and that’s the way it is on April 30th, 1070” as he closed the CBS Evening News. The country went crazy over Nixon’s announcement. Students protested at Kent State University in Ohio. On May 2nd the Kent State R.O.T.C. offices were burned out. The next day, the Ohio National Guard was sent to the campus. Ohio Governor James A. Rhodes promised to use “every force possible” to maintain order. Rhodes denounced the protesters as worse than “brown shirts” and vowed to keep the Guard in Kent “until we get rid of them.” On May 4, about 1,500 student protesters gathered on campus. Four students were killed and nine others were wounded when a contingent of Guardsmen suddenly opened fire during a noontime demonstration. Finally my application to the National Guard came through. It was raining the day I arrived at the processing station at Fort Ord. A stern sergeant lined us all up in a loose formation and laid it out: We would be processed over the next few days and assigned to our various basic training units within a week. There would be haircuts, shots, tests, more shots, more tests. The first day we all got haircuts. I could really feel the morning Monterey breeze with my new buzz cut. Later on that day we were issued Army boxers, tee shirts and socks, a duffle bag, Army greens, fatigues, boots and other gear. We were beginning to look like we belonged in the Army. National Guardsmen (NGs) were trained alongside the regular Army draftees, but you could always tell them apart. The NGs knew they were going home after their training and didn’t pay a lot of attention; the regular Army trainees were eager to learn all they could because most of them would be sent to places where their lives depended on their training. Basic training wasn’t that tough. I was assigned to unit A13 (Company A, First Battalion 3rd Brigade) and issued a punch card. If we did something above and beyond the call of duty we could get our merit cards punched by a training officer or NCO. It didn’t take much to get your card punched. Things like looking sharp at morning roll call, extra shiny boots, a good shot pattern at rifle training. The whole merit card system was somewhat juvenile. If we got enough merit points we could actually go home for a weekend during basic. One morning toward the end of August I got a call from Linda telling me she was pregnant. I was stunned. I had been gone for two months. I didn’t have a job, and had just signed up for college; our only income was the meager pay I was getting from the Army while in basic training. Linda was living with my grandparents. After nine weeks of basic training, we were promoted to A.I.T. (Advanced Individual Training) and assigned an M.O.S. (Military Occupational Specialty). My MOS was 94B20 – cooks helper. Hardly a “tough soldier” MOS, but soldiers need to eat. I was never told why I was selected to be a cook, but two weeks after basic I was one of forty future Army cooks standing in front of a stove. The first thing we learned that day was how to crack two eggs at the same time. I also learned how to make jellyrolls from scratch. In nine weeks I went from not knowing how to flip an egg to being able to cook a meal fit for a general. But I was glad to be going back home. I arrived home in time for Rene’s first birthday. We lived with Grandma and Grandpa for a couple of weeks while we looked for a place we could afford. Grandpa had softened his negative attitude toward Mexicans while Linda was living with him. So much for the racist old Indian. We ended up at the Brown Top Trailer Park again. All the old tenants were still there, probably because of the low rent. This gave kind of a homecoming atmosphere to our return. We had moved up to a bigger trailer on the other side of the park, away from the heavy traffic. It was a lot roomier, and had a small dining room table that would accommodate two place settings. We also liked the fact that the built-in heater could be turned on without a match. There was a front and a back door. I had to have a place to study so I nailed a piece of wood across the back doorway. That was my desk. I could sit there in the doorway and study in the fresh air. Above the door I built a shelf for my reference books. I’d never had a study before, and it was magical. The trailer was older than our first one but in much better shape. The paint was fresh and there was a small yard. We didn’t worry much about theft. Any burglar who wanted anything of value would just keep driving past Brown Top. We could open the curtains along the front end of the trailer and let the sunlight in once in a while. The landlord had paved the dusty dirt road in the trailer park. Life was good. In February 1971 I started at Delta Junior College. I had never known anyone personally who had gone to college. I still had my job at Paul Cox Studio, the paint store whose owner had once given me unused paint to paint the shed out in front of our trailer. Mr. Cox was a retired executive from a major Northern California furniture chain. He had worked himself up to a mid-level management position and taken an early retirement to start his own business. One night Mr Cox invited Linda and me over for dinner. He and his wife – “the love of my life, Betty” – lived in the nicer area of town. I had never had a reason to go into this area before. I parked my ’57 Volkswagen in front of his house. We got out of the car quickly so that Mr Cox wouldn’t come out and see the piece of junk we were driving. I was afraid he would notice the bald tires or the peace symbol that was standard issue for all VW bugs. I really needed this job so I didn’t want to make any political statements. I was in awe of the Coxes’ house: no broken windows, no peeling paint, a lawn that covered all the dirt in his front yard. I had never been in such a nice house. It made me see what could be possible with a little luck and a good education. At the same time it seemed to push those possibilities further from my reach. How do we get from a trailer in a dusty trailer park to a house like this? Paul altered my work schedule to fit around my school schedule. I was lucky: whenever my tuition was due or I needed money for school, business at the studio would be good enough to generate bonuses for the employees. Several months later, when Paul found out that I was going to major in accounting, he let me start doing some bookkeeping for him. When I went back into the records, I discovered that my school needs had mysteriously dictated when the bonuses came. A bomb explodes in the men’s room at the U.S. Capitol; the Weather Underground Organization claims responsibility. U.S. Army Lieutenant William Calley is found guilty of twenty-two murders in the March 16, 1968 My Lai Massacre and sentenced to life in prison. A Los Angeles, California jury recommends that Charles Manson get the death penalty. A lot of bad stuff happens in March of 1971. One really good thing that happens in March is that Darrell Ray Griffin, Jr. is born. I have to explain the whole thing about naming him “Darrell, Jr.” Years later he would ask me if I named him Darrell because it was cheaper. To this day I cannot remember why we gave him that name – my name. But I’m glad we did. Having the same name always made us feel closer. We brought him home to the Brown Top Trailer Park. His sister Rene was now sleeping on the fold-out couch-bed in the living room part of the trailer. Skip had a bassinet that Linda got from her baby shower. It was near closing time and Mr. Cox had his feet on his desk reading the New York Times. I had mixed my last gallon of paint and was cleaning and shutting down the paint machine for the evening. As I walked into the office to say goodnight to Mr. Cox I noticed a headline: “’72 Draft Lottery Assigns No. 1 to Those Born Dec. 4.” In 1971 anyone who had a selective service lottery number lower than 125 had a good chance of being drafted. The draft lottery number for my birthday, June 21, was 296. This meant that I would never have been drafted. I had taken a gamble back in May of 1970 and joined the National Guard. Now I was locked into six years of meetings twice a month and two weeks of service every summer, but I was pretty sure that I wasn’t going to Viet Nam. I didn’t really mind being in the Guard. It was like a weekend job. I always felt a little guilty about the guys that got drafted and went through basic training with me at Fort Ord. I knew I was going home after basic and they were going to be trying to stay alive in Vietnam. I would go to NG meetings twice a month and get paid for it. It wasn’t much, but since I was making close to minimum wage it definitely helped the family budget. trailer had only two rooms and it was difficult for the combatants to find our own space to cool off in. I sat down between Rene and Skip and gave them a hug. Rene looked up at me and asked: “Do I have to get married when I get older?” “No,” I said. “Why?” “Well, I don’t like arguing and mommies and daddies always argue and yell at each other.” I tried to explain to her that being married didn’t mean you had to argue all the time, but I was pretty sure that she was sticking with her view of marriage. Skip would be playing fifteen feet away and Linda would be watching TV. It was winter so the kids had to play inside most of the time. looks great on the inside, but the outside needs a lot of work. If you agree to fix it up I’ll let you live in it for what you’re paying here.” Given our current situation, it sounded like a good offer. It was a small two bedroom house just down the street from the Bachelor Adult Bookstore. The back yard was overgrown and looked like the thicket where hobbits lived. But the house itself was huge. It was newly painted and the carpeting was new. The kids were still sharing a bedroom but at least they were in a normal house. This didn’t stop our bickering. We were two kids trying to raise two kids. It was only a matter of time. picked a bunch of leaves. We put them on a cookie-sheet pan, dried them out and rolled them into joints. I didn’t get much homework done that weekend. Soon this became a regular ritual. Then the stress of keeping up with my classes started getting to me, so a doobie or two during the week made sense. Within three months I had to drop all my classes at Delta. One day my Franklin High School yearbook arrived in the mail. I lit up a joint, grabbed a glass of wine and started flipping through the pages. How cool, I actually graduated from high school! So now what? I was lousy at skilled-labor jobs. I used to get Grandpa Moxley boiling mad because he would be under the car working on it and ask me for something like a seven- sixteenth box wrench. The instant I heard him yell, “Skip, bring me…” I would panic and start rummaging through his footlocker toolbox on the garage floor. I could never find what he wanted. Where I grew up a man was measured by the size of his tool box and what it had in it. If you had a robust collection of Snap-on-Brand or Craftsman tools you were at the top of your game. Maybe part of the reason I felt inadequate as a young man was that my tool box had only a few tools and they were the ones I bought at the local auto supply store 88-cents bin. It occurred to me that since I wasn’t very good at skilled labor, maybe I should take college more seriously. Whenever I went to check on Rene and Skip, Jr. while they were asleep, I felt guilty. They always looked so peaceful, knowing in their little hearts that Dad had it all together. Dad would be a good provider. Dad wouldn’t let them grow up poor. The image of Skip sitting on the couch imitating me as I did my homework, underlining passages, drawing circles around paragraphs and dog-earing pages, made me smile. I didn’t want him to imitate me smoking weed. One night I just quit. It wasn’t easy. Most of my relatives were stoners. At Christmas time thirty or forty family members would gather at Grandma and Grandpa’s house for the annual gift exchange and Christmas dinner. There was always a room set aside for getting high. It was tough to avoid that room. But then I would talk to some my cousins about their money difficulties and how their unemployment checks didn’t even cover their dope costs and their regular bills. Suddenly it got a lot easier. This is another segment of “Last Journey.” This is a book that is written by me with the help of my son SSG Darrell Griffin, Jr. He was killed by a sniper just outside of Baghdad. At the time he and I were working on a book that we planned to call “The Great Conversation.” He was conflicted about having to kill men or be killed. He was a philosopher and he had difficulty reconciling his mission as a combat soldier with the teachings of the great philosophers. This is except 4. We will be putting excerpts on this blog for the entire book so we estimate there will be about 100 excerpts. The girl I got pregnant, Linda Sanchez, was Darrell Jr’s mom. I remember her being the only kid at school who drove a car that was one color and didn’t have any part of it painted with primer. She wasn’t supposed to be going to Franklin High School in Stockton because she lived in Lodi. Her mom was single and worked in Stockton so Linda was dropped off at her Grandma Zuniga’s who lived close to the school. We met in our junior year. Linda’s mom was always at work so we spent more time at her big house out in the country than we did in school. Days at her house with raging hormones and no parents around created the perfect setting for her getting pregnant. Grandpa wasn’t too happy when he found out. He felt a lot of his troubles in life were related to his being an Indian in a white man’s world. He was proud to be part of the Ottawa Nation, and looked just like the Indian on the face of a buffalo nickel. He didn’t have much use for anyone of color and it bothered him that I would have a Mexican girlfriend. “Are you telling me that you couldn’t find a decent white girl ?” screamed Grandpa Moxley. He got his crippled legs under him, grabbed his cane and pushed himself up. His legs had been frozen into a sitting position from his years of severe arthritis. As he hobbled toward my bedroom door he turned and said, “You’re messing up bad. I had hoped that you could have moved up from busboy to fry cook.” He shook his head. “You’re just like your no-account dad. He never was anything and never will be and neither will you.” He gave me a month to move out. I had to get permission from the Juvenile Justice Department in San Joaquin County to set up a household with Linda. Since we were both under age we had to demonstrate to the assigned probation officer that I had a job and a plan to finish high school. We were married in July 1969. I was working full time as a dishwasher and completing my junior year of high school. It was hard to find a place we could afford to rent and it was even harder to convince any landlord to rent to a sixteen-year-old boy who looked fourteen. I hadn’t even begun to shave. We finally found a place to rent. The Brown Top Trailer Park was a place where only desperate people lived. There were about thirty trailers in the park. In the center of the park was where the two washer-and-dryers were located. Next to the laundry was a trash bin that was always overflowing with garbage and liquor bottles. Our little eight-foot-by-twenty-foot trailer was located across from the garbage bins. On hot days the sound of the buzzing flies would almost drown out the noise of the busy road that was about twenty feet from our trailer. Behind the trailer was a fence that was held up by six-foot-high weeds. The trailer was old. It had layers of tar on its roof to stop the rain from coming in, and a little two-step splintery stoop in front of the door. A dilapidated storage shed stood on the concrete slab that served as our porch. I talked the landlord into letting me sand down the splinters and paint the shed and the steps. I found a paint store, Paul Cox Studio, that sold its mixing mistakes for next to nothing. Mr. Cox gave me two quarts for free. Soon the stoop and shed were a light purple (the only mixing mistake the store manager had at the time), but at least there were no more splinters. Rene and her future little brother, Darrell that would later be born on March 13, 1971. I was sitting in my eleventh-grade English literature class when a runner from the attendance office came in and handed the teacher at the front of the room a note. Mr. Bentley looked directly at me. “Darrell, can you please come here for a minute?” I was so absorbed in coming up with an excuse for not having my homework assignment ready that I forgot that today was the planned due date for Skip’s older sister to be born. With a disgusted look on his face he said, “Well, Darrell, it looks like your wife is going into labor. You are excused from class.” I went back to my desk to pack up my books. “Before you leave, the attendance office wants to see you.” As I walked out of class the guys who thought they were cool gave me the “thumbs up” sign. The smart kids just looked at me and shook their heads. When I got to the attendance office the attendance lady and my guidance counselor were in a huddle and obviously talking about me. They broke apart the instant they saw me through the glass of the office door. The attendance lady said, “Darrell, before we can officially let you off campus you have to bring back proof that your wife is in labor. You need to bring back a note from your wife’s doctor or at least from your wife.” I rushed home, had Linda write me a note and took it back to school, then ran back home and took her to the hospital. Later that day, Darlene “Rene” Griffin, Darrell Jr.’s older sister, was born. They came home two days later. Rene slept in a bassinet in the living room. I stayed home from school for a couple of days to help Linda with Rene. Neither of us knew what we were doing. There was no glamour in midnight feedings and changing full diapers. I remember sitting up late one night thinking that if you put my and Linda’s ages together – thirty-two – it would be a good age to have a child. Every week I went to the California National Guard offices to see how my application was going. The United States was deeply involved in the Vietnam War and the National Guard didn’t get sent to Vietnam. It wasn’t the idea of fighting in Vietnam that bothered me; it was the fact that there didn’t seem to be any reason for it. I had a copy of my completed National Guard application on my headboard along with brochures for Canada. There was no way I was going to go to Vietnam and fight in Nixon’s war. I had just gotten home after a long day at school and an afternoon shift of washing dishes at the Hoosier Inn. I was lucky to have this job. The owner, Charlie Dyer, always let me move my schedule around my school schedule. The staff was like a second family. On occasion Charlie or Mrs. Dyer would help me with my math homework. June 7 is National Doughnut Day. Whether you’re partial to the cream-filled, glazed, jelly or chocolate varieties, the doughnut is something near and dear to so many of us. I did my part to celebrate Nathan Doughnut Day. Today is my son, Jordan’s last day of school so I got 3 dozen doughnuts at Earl’s Donuts in Northridge, CA. If you are in the area they are on Devonshire Blvd, near Mason Ave. Support your local donut shop. The Salvation Army established this sweet holiday in 1938 to raise funds during the Great Depression and honor the “lassies,” as they called the female volunteers, who supported the soldiers on the front lines during World War I, serving them delicious meals, and of course, doughnuts. Approximately 250 “lassies” provided assistance to American soldiers in France in 1917. 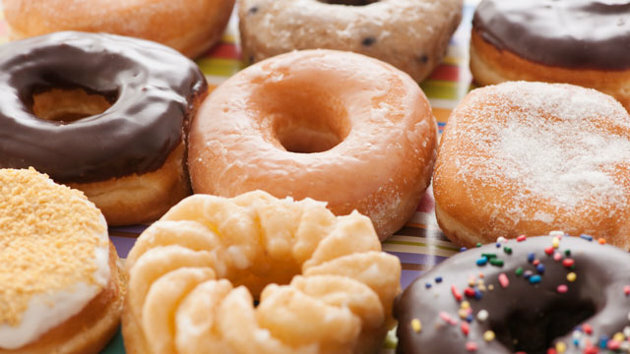 Fast forward to 2013 and many national chains and smaller shops are offering free doughnuts to celebrate. Krispy Kreme will be giving away a free doughnut of any variety to every customer at participating locations, while supplies last. No purchase necessary. The chain is offering a free doughnut with any purchase on Friday. For the third year in a row, Entenmann’s will donate $1 to the Salvation Army for every new “Like” on the company’s Facebook page through June 15, up to $30,000. You can also enter for a chance to win free Entenmann’s doughnuts for a year. Can’t get enough doughnuts? Check out the cronut, the half-croissant and half-doughnut hybrid, which is taking New York and the pastry world by storm.